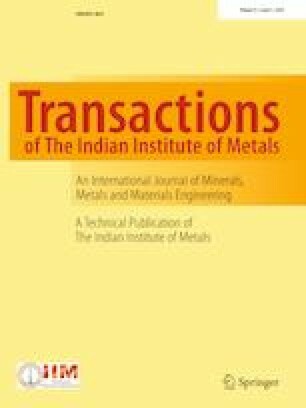 In the present study, effect of quenching/cooling conditions on microstructure, impact and hardness properties of custom-made Al–15Sn alloy were investigated. Heat-treated Charpy V-notch rectangular bar specimens were suddenly quenched in normal water (28 °C), cold water (6 °C) and ice bath (0 °C). Further, experiments were repeated and allowed to cool in an open atmosphere (air) and furnace to achieve different cooling conditions. Impact and hardness properties were assessed for the alloy quenched/cooled in different conditions. Microstructures revealed that alloy quenched in cold water showed finest (4.9 µm) Sn phase particles compared to other cooling conditions. Specimen quenched in cold water exhibited highest impact energy (77 Joules) and hardness number (RHN 90.7) whereas as-received sample showed least impact strength (32 J) and hardness (RHN 73.5).